I was a little disappointed in this adaptation of Alice in Wonderland. Believe it or not, but I wanted it to be weirder. And with Tim Burton directing, you know you’re automatically going to get weird, so I was a little let down. I heard that this film was actually a combination of Lewis Carroll’s two books, and not just a new version of the first one. First of all –and I do realize that I bring up titles a lot– but I’m pretty sure it’s called Alice in Wonderland, not The Mad Hatter in Wonderland. I felt this movie focused just a little too much on the Mad Hatter character. Don’t get me wrong, I love Johnny Depp, I just felt like he had too much screen time for this particular film. And yes, Tim Burton wanted to make the story flow in a more narritive kind of way, but I felt as though some of the exploration, or in this case, “revisiting” of Wonderland was sacrificed to do this. And thereby the audience interacts more with the Mad Hatter than with Alice. Even the majority of the movie posters were of him too! And while we’re on the subject, what was with the Irish Captain Jack Sparrow? I thought that was funny. 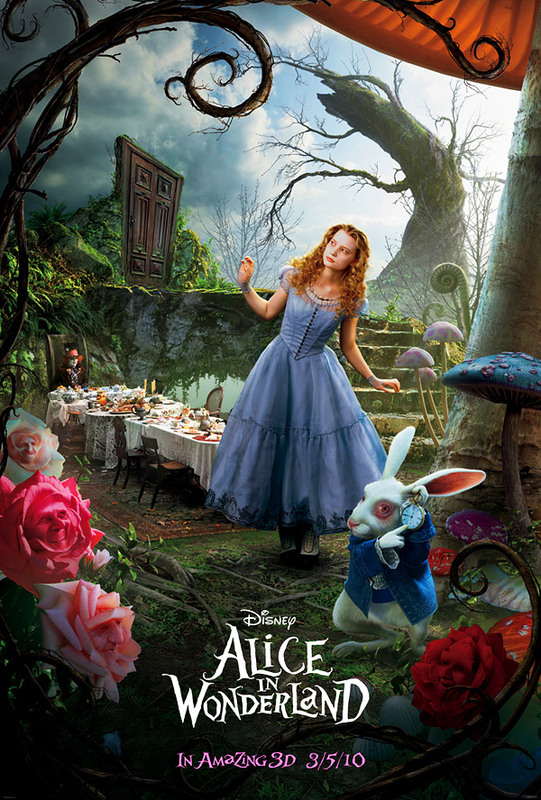 Even though Alice in this film is a teenager and is actually returning to wonderland, rather than discovering it for the first time as a child (which is a take I liked), I wanted to explore this world a little more. Have Alice rediscover this place and see the strange things and events that happen there. She’s already doubting her sanity when she starts meeting the inhabitants of Wonderland; I wanted that to show a little more. Becuase she had dismissed her first encounter with these characters as a dream, they could have showed her coming across things that could only be encountered in a dream. I remember the Disney animated version that had the odd creatures such as the rocking-horse-fly, and that …thing that looked like walking glasses with a beak, and the dog with a brush on its face that swept away the path Alice was following to try to get home. But all we got in this movie was a fencing mouse with an attitude, and a hare that looked like he was going through withdrawal, and a bloodhound that talked. Whoop-di-doo. And I’m not really sure what to make of the queens and the whole battle scene. Again, I haven’t read the books, and none of the other films I’ve seen have included that ordeal. Maybe with a little more background to it, I could have been content with the tension between the Red and White Queens. Something was just missing, which consequently did not capture my interest enough to care about the fate of Wonderland. The costume designs were great. I really liked all of Alice’s wardrobe (minus the suit of armor). But overall this movie was a bit of a miss for me. This entry was posted in fantasy, PG and tagged 2010, Alan Rickman, Anne Hathaway, Crispin Glover, Disney, film adaptation, Helena Bonham Carter, Johnny Depp, Mia Wasikowska, Tim Burton. Bookmark the permalink.